What is password hash synchronization with Azure AD? Password hash synchronization is one of the sign-in methods used to accomplish hybrid identity. 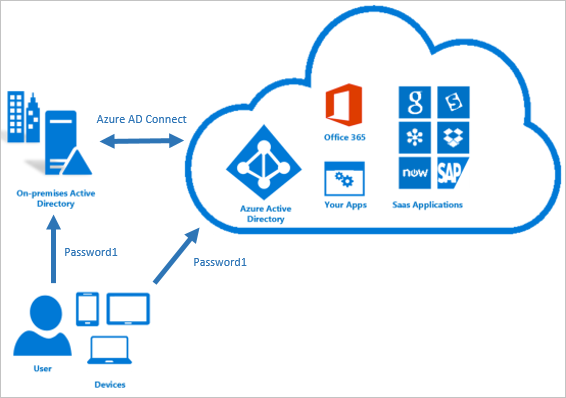 Azure AD Connect synchronizes a hash, of the hash, of a users password from an on-premises Active Directory instance to a cloud-based Azure AD instance. Password hash synchronization is an extension to the directory synchronization feature implemented by Azure AD Connect sync. You can use this feature to sign in to Azure AD services like Office 365. You sign in to the service by using the same password you use to sign in to your on-premises Active Directory instance. Optionally, you can set up password hash synchronization as a backup if you decide to use Federation with Active Directory Federation Services (AD FS) as your sign-in method. For more information, see What is hybrid identity?.